Best Cheap Box Mods of 2018 | Vaping Cheap - Daily Vaping Deals & The Best Vape Product Reviews at Vaping Cheap! When looking for a new box mod, it can sometimes be an overwhelming task, especially this year as there are tons of options on the market. It’s even more daunting when looking for one that’s affordable that will not only provide you with an excellent vape experience, but has great build quality, ensuring it will last for quite some time before needing to replace it. We often get the question “what is the best cheap box mod”, so in this extensive article we’ll cover some of the best vape mods that’ll give you the best bang for your buck! Although there has been many box mods being released this year, there were a select few that really caught our eye in regards to overall design, performance, ergonomics, and price. Most devices listed in this article will be around $50 with many being under $50. Before diving into this list we do want to mention that there is no particular order, and we do want thank our sponsors: GearBest, UrVapin, CVapor and Efun Top. Smoant has continuously impressed us this year and it all started with the Battlestar 200w TC Box Mod. This is one of their newer devices, and it has become one of our favorite dual 18650 box mods. The Smoant Charon has a ton of features including temperature control for Ni200, Ti and SS wires alongside a TCR mode, so you can easily fine tune your vape experience! In addition, it is firmware upgradeable, so you’ll always be up to date with this device. The Charon 218w TC Box Mod has a sliding battery door that is held on with magnets, making it incredibly easy to access your batteries. It also features a 0.96 inch OLED display screen and a simple three button control face, making it user friendly. What’s great about the Smoant Charon is all the safety features built in such as short circuit protection, low resistance protection, overheat and overcharge protection, automatic cut-off and more! Overall, the Smoant Charon 218w TC Box Mod is easily one of the best affordable vape devices on the market today. It’s packed with a ton of features, and is very comfortable to hold thanks to its ergonomic design. If you’re after a well construction dual 18650 box mod, then we highly recommend this one. Purchase Here with Free Shipping! The USV-L 75w TC Box Mod is one of those devices that kind of went under the radar, and is not one of the most popular mods. However, it’s one of the better single 18650 devices on the market in our opinion, especially when you consider all of its features and unique design. Although it looks rather simple, it features a stealthy appearance with its dual sliding battery bay, which not only conceals the battery, it also hides the display screen, which is what gives it its stealthy appearance. The USV-L is powered by the VO75 chipset giving you a maximum wattage output of 75w, and provides temperature control for various wire materials with a resistance lock feature, which is essential when vaping in TC mode. This chipset also features a power curve mode, which gives you complete control of your vape experience, and is very handy for those thicker exotic coil builds. The atomizer resistance range is 0.03 ohm to 3.0 ohm, so it’ll easily handle all coil builds you throw at it! All in all, the USV-L 75w TC Box Mod is an excellent choice for the vaper looking for an all metal constructed single 18650 box mod. If that’s what you’re looking for, then definitely check out the USV-L, you won’t be disappointed. The Wismec Reuleaux designed by Jay Bo is one of the most popular line of box mods on the market today and for good reason! 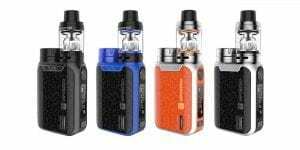 The Reuleaux RX2 20700 is the newest addition to this line of devices, and is completely different from the rest since it can house 2 high drain 20700 batteries! We’ve seen more and more devices utilize these batteries as they offer more battery life in comparison to the traditional 18650. However, you can use two 18650 batteries if you prefer using the included battery adapter. The Reuleaux RX2 is also backed by the newest 200w chipset from Wismec, and it boasts a new 1.3 inch OLED display screen, so it’s easy to see all of your vaping information such as resistance, wattage, output voltage and more. It also features temperature control for Ni200, Ti and SS wires alongside a TCR Mode. Just like the past Reuleaux devices, the RX2 has a ton of safety features, and is firmware upgradeable. Overall, the Wismec Reuleaux RX2 20700 200w TC Box Mod is a solid addition to the series. If you’re the vaper wanting to utilize the new 20700 batteries, and looking for a device that won’t break the bank, then this is the vape mod for you. Box Mods that feature resin have become incredibly popular, especially in 2017. However, many of them can be quite costly due to the Resin material. Thankfully, the Aleader Funky 160w TC Box is not only affordable and packed with features, it also has interchangeable Resin face plates! 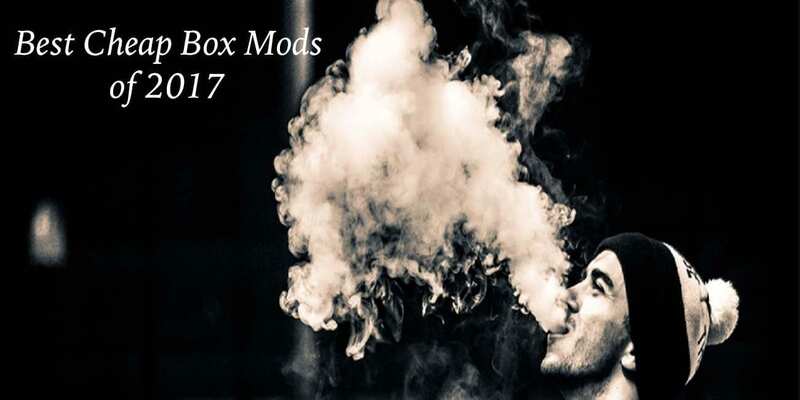 With its Resin design, no two box mods will be the same! In addition, it has multiple color options available which are the ever so popular Rainbow, and Stainless. The Aleader Funky also features a unique water resistant OLED display screen, which is quite large, making it easy to read. This device also has temperature control for various wire materials including the most popular, Stainless Steel. With its 3 different power modes (Soft/Standard/Powerful), you can easily customize your vape experience. Not to mention, the powerful mode is great for exotic coil builds such as Claptons, and Aliens! All in all, the Aleader Funky 160w TC Box Mod is one of the most affordable Resin vape mods on the market today. So, if you’re looking for a new resin box mod that’s cheap, then we definitely recommend this device. The Geekvape Aegis 100w TC Box Mod is one of the toughest, if not the toughest device available on the market today. It was designed to be shockproof, waterproof and dustproof, and it certainly is so. The Geekvape Aegis is still one of our favorite 26650 box mods on the market today, and even if you didn’t want to use a 26650, there is a separate battery cap available for purchase that allows you to use 20700 and 21700 batteries! The Aegis does have 7 different output modes including Ni200, Ti, SS316, Kanthal, Bypass and more! The 0.91 inch OLED display screen shows various vaping information such as output power, Amp range, atomizer resistance and more. The threaded battery cap, ensures that even if you dropped this mod, the battery stays safe and secure. What’s great about this device is that even though it can house various battery sizes, it still remains fairly compact, making it easy to carry in the pocket. Overall, the Geekvape Aegis 100w TC Box Mod is perfect for the vaper looking for a single battery device that can easily withstand a beating. If you’re looking for a well constructed mod that has a ton of features and can utilize various batteries, then we highly recommend the Aegis by Geekvape. The Vaporesso Swag 80w TC Box Mod is one of the newest devices coming from Vaporesso and it’s powered by its new OMNI 2.0 board. The original OMNI board was incredibly popular due to its excellent performance, and this new board is similar to the one found in the Vaporesso Revenger X 220W kit. This single battery device is very compact, making it great for traveling with and perfect for stealth vaping. Even though it’s small, it does pack a punch with its 80w maximum wattage output. Since being powered by the OMNI 2.0 board, it provides the vaper with 6 different output modes including Ni200, Ti, SS316 support, CCT (customized curve of temperature), CCW (customized curve of wattage) and Smart VW, which automatically adjusts to the ideal output based upon the attached atomizer. It does also have a TCR mode like other vaporizers mentioned in this article, allowing you to customize the settings to match the exact wire material you’re vaping on. All in all, the Vaporesso Swag 80w TC Box Mod is a great choice for the vaper looking for a discrete box mod that utilizes an external battery. If that’s something you’re after, then we definitely recommend checking out this device. The Tesla Nano 120w Steampunk Box Mod is another widely popular device due to its unique design, and solid construction. Since being primarily constructed of die cast zinc alloy, it ensures excellent durability and provides a hefty weight, so it actually feels like something of value when you’re holding it in your hand. A unique feature to this box mod is the physical on and off switch, which is not something we see too often with mods, but it’s definitely a nice addition and allows you to easily turn it on or off. 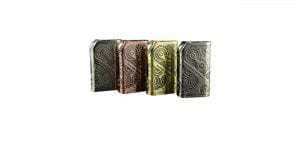 The Tesla Nano 120w does feature a steampunk design, and is available in four different colors which are copper, brass, black and grey. This device does have a maximum wattage output of 120w, and can fire down to a 0.05 ohm in TC mode and a 0.1 ohm in standard wattage mode. The hinged battery door means it’s quick and easy to access your batteries, and it has a slanted firing button that’s perfectly positioned for comfort. Lastly, it has a maximum voltage output of 9v, which is perfect for your higher resistant coil builds! The Tesla Nano 120w Steampunk Box Mod is a solid choice for the vaper wanting a heavyweight dual 18650 device that has a ton of features. Be sure to check out our full review if you’re interested in reading our full thoughts on this device. The Think Vape Exus Ark Mod is another device isn’t well known and went under the radar. This device is powered by the ST 200 chipset which provides a maximum wattage output of 200w using 2 high drain 18650 batteries. 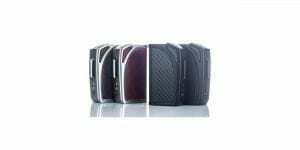 The Exus Ark Mod is available in four different colors which are Carbon Fiber, Black, Brown and Brushed Silver. Depending on which color you choose will determine what cover you receive. For example, both the Brown and Brushed Silver feature a brown leather, and the other two will either have a Black leather or Carbon Fiber. All four of the color options all feature the alloy metal frame, which is certainly eye appealing and will turn heads at any vape shop! The Think Vape Exus Ark also features a stainless steel 510 connection and a silver plated contact, ensuring excellent conductivity. Not to mention, it can accomonodate atomizers up to 25mm in diameter, so you can easily use most of your favorite top RDAs, RTAs and sub ohm tanks! Lastly, the sliding magnetic battery access door makes it easy to access both of your batteries. Overall, the Think Vape Exus Ark Mod is another solid performer that easily deserves a spot on this list. Although this one went under the radar, it doesn’t take anything away from the value it provides the user. Smok has released a lot of devices this year, but the Smok ProColor is the one that really stood out to us. This box mod features a new and improved interface making it simpler to use than ever before. The ProColor is available in a wide range of colors including Black, Rainbow, Red, Blue, Green, Silver and much more. In addition, this device is available alone or as a full starter kit which includes the popular TFV8 Big Baby Beast Tank. Like other Smok mods, the ProColor has many features such as temperature control (Ni200, Ti, SS), TCR mode, PreHeat capability, three setting output modes (Hard, Soft, Normal), and more. In addition, it features a customizeable LED light on the front, and you can choose from 12 different colors. The ProColor also features a side firing bar, which you can easily squeeze to fire. Lastly, the Smok ProColor 225w is firmware upgradeable, and features a new vibrant display screen. All in all, the Smok ProColor 225w TC Box Mod is easily one of the best Smok has to offer this year. If you’re a fan of Smok and looking for a new dual 18650 device for cheap, then we do recommend the ProColor. The Wismec Sinuous P80 TC Box Mod is a followup to the Predator, but sports a much better and solid 510 connection and a smaller design. This device does require a single high drain 18650 battery for operation, and has a maximum wattage output of 80w. Like the Predator and other Wismec devices, the P80 has a full temperature control suite and a TCR mode. The 0.96 inch OLED display screen is easy to see, and it’s easy to use thanks to its simple three button control. Since the Wismec Sinuous P80 has a centered 510 connection, most of your favorite RDAs will sit flush with zero overhang! What’s great about the P80 is the addition of the PreHeat function, which is great for your Clapton coil builds. The minimum firing resistance in TC mode is 0.05 ohm and in wattage mode it is 0.1 ohm. Similar to Smok devices, it also features a squeeze fire button, and the screen itself is integrated into the fire button. 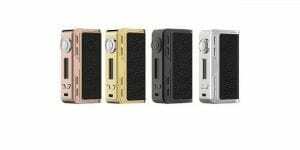 Overall, the Wismec Sinuous P80 80w TC Box Mod is another great option for the vaper looking for a compact single 18650 device. If that’s something you’re after, the P80 will certainly satisfy your vaping needs. In conclusion, these are some of the best cheap box mods of this year. Although there are many devices that were released this year, these are the box mods that really caught our attention in regards to their design, performance, availability and price. As mentioned earlier, most if not all of these vaping devices can easily be found for under $50. 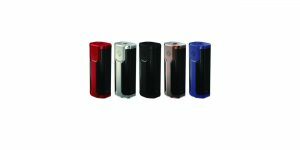 We did list a variety of devices as well ranging from dual 18650, single 18650, 20700 and even 26650 box mods. Just as a reminder, when using any electronic cigarette, be sure to fully understand battery safety and ohms law! Regardless if you’re vaping at higher wattages and low resistances or lower wattages, it’s incredibly important to understand these two aspects in vaping. We do hope this article helps you in finding the right box mod to fit your vaping needs! If there’s a mod you feel should be on this list and wasn’t mentioned above, let us know in the comments down below! Also, feel free to let us know which mod is your favorite and why! We look forward to reading your comments! Thanks for reading! The JAC Series-B DNA75 was probably the single best mod investment I made this year. At $80 (no discount), it’s above the $50, but less than some of the other mods I see on the list. Like all things vape, these opinions are personal.